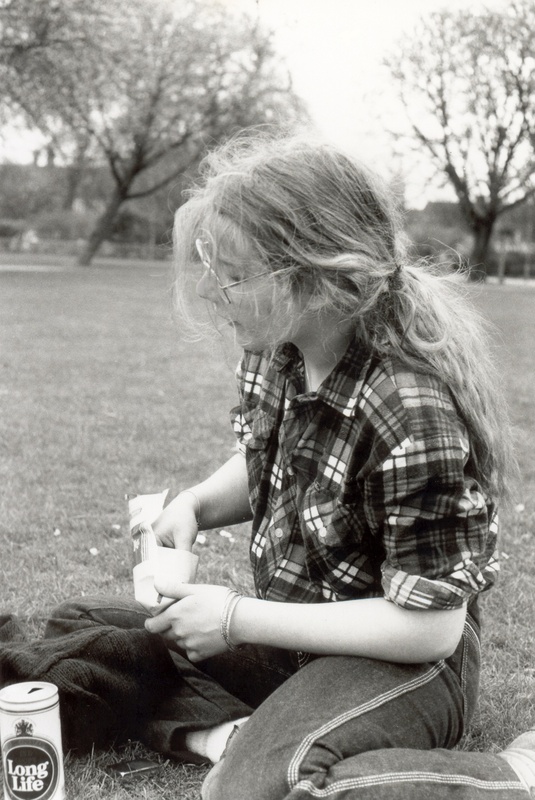 Image description: Black and white photo of the author’s sister, Helena Griffith, sitting on the grass and rolling a cigarette. She is about 17, with long hair and glasses. A can of Long Life beer is by her knee. I was reading the paper this morning and was reminded that tonight Seattle musician, Brandi Carlile, is up for 6 Grammy Awards. I’ve only seen her perform once, at a private event nine years ago, but the memory of that night is strong and visceral so I thought I’d repost my thought from that event. Enjoy. And, Brandi, if you’re reading this: Thank you for that, and good luck! Last night I went to a private event for the Women’s Funding Alliance. We were feasted by Seattle celebrity chefs (including Becky Selengut—who created the insanely fabulous food for our 20th anniversary celebration three years ago). The food was superb. The wine flowed freely. Brandi Carlile sat at the table next to ours. Later, when someone bid an astronomical sum (five figures) for a request, she played Leonard Cohen’s ‘Hallelujah’. Just her and a piano, in touching distance. It’s a powerful piece—love, lust, longing, loss—and was a favourite of my little sister, Helena. Hearing it unexpectedly, live, by someone who really knew what she was doing, made me weep right there at the table. There was a moment, as she figured out the range and first few chords (she normally does this song on the guitar), when I could have locked it all down and listened with a perfectly poised and pleasant expression. But then I remembered the point of the evening, which was to raise funds for women and girls who need help. And, oh, Helena had needed help. I had tried to give it, but she died anyway. So I let art do what it does, let it tear through the polite and careful curtain of my public persona, and wept. But I’ll be giving to WFA and other organisations who help women and girls. And perhaps next time you see a woman or girl, homeless or hungry or otherwise in need, you will too. Brought tears to my eyes. It did the first time I read it and now again today. Thank you for sharing these memories.